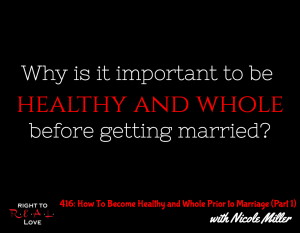 In this episode, Jay is joined by author Nicole Miller to address the question: Why is it important to be healthy and whole before getting married? Why is it important to be healthy and whole before getting married? What does i mean to be a healthy and whole person? The importance of entering relationships healthy and whole. Why some people struggle with taking time to themselves before entering into relationships. God’s intention for us to be whole. The danger of looking for our identity and purpose in the wrong places. How to determine whether or not we are truly healthy and whole. Don’t be afraid to look in the mirror and examine whether you are truly healthy and whole…or not. Take an inventory of your relationships and determine if they are balanced and in alignment. Continue reading your Bible and begin reading a book to help.